Per lucy, this is berserker-usable, yes. #Anonymous, Posted: Jan 05 2004 at 7:06 PM, Rating: Sub-Default, (Expand Post) As a human monk the ultra vision rocks, did i mention the see invis and the 41% haste and the uber stats, I just love it. #RendaelBrigh, Posted: Feb 29 2004 at 11:49 PM, Rating: Sub-Default, (Expand Post) Haste? i'm right there with ya Pariator. we've dropped AL a number of times, gotten this once. went to a ranger rather than one of the hybrids who are still stuck in 28ac ornate helms. hope they get a lot of use out of that 45ac for the three seconds they can stay alive tanking. hmmm... well last time i looked wars tank more in the harder areas than SK's and pallies do.... they have MUCH better and eaier items to recieve via quests an mob kills... and an extra 20 or less ac wont make much difference when a mob hits for 2k+ damage and flurries and quads and goes thru deffence. 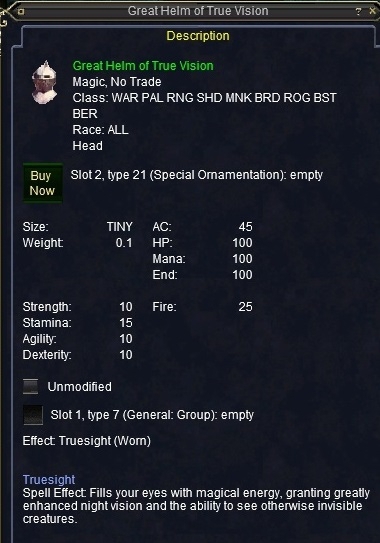 If youre still wearing ornate helms and can get this.... im sorry but go get urself some better gear from LDoN and aug it or get an AC aug... whoever wins it wins it... thats why they made it avaiable to all these classes. Edit: Also in my previous guild we have several Rangers who tank better than most SK's and Pallies.... matter of fact our ta is a ranger... just goes on gear and aa's. Run when you hear "Can I tank, Can I tank?" Leather classes have a harder time finding great gear like this. My warrior can always get a helm of rallos zek. Geeze, bout time there was a helm that us followers of Karana could use that would give use the same nice buff as helm of the tracker...just wish they would add the "Karana" deity only just to **** off the spoiled BRATS of Tunare! I wantr to know why that HO get's all the cool stuff.....the new Blessed Faydark Bow...omg....come on VI...you forget there are other gods out there.